In the early '70s, the environmental movement was gaining momentum, and Howard "Bud" Ris (MLA 1975) was eager to be a part of the promised changes. "A new consciousness about man's role as a steward of the planet was taking hold. Landscape architects had a huge role to play, and we all left ESF eager to take on this new responsibility," Ris said. After leaving ESF and attaining senior positions in a consulting firm and various government agencies, Ris joined the Union of Concerned Scientists (UCS), headquartered in Cambridge, Mass., a nonprofit partnership of scientists and citizens combining scientific analysis, innovative policy development and effective citizen advocacy to achieve practical environmental solutions. 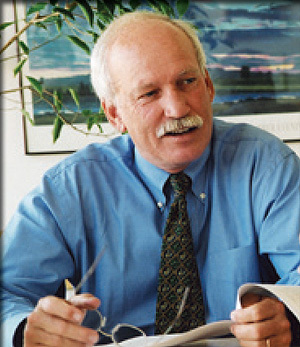 By the time he retired 22 years later as president, Ris had helped the organization expand from a handful of scientists focused on nuclear arms control and national energy policy to a multi-issue environmental organization tackling a range of public policy issues from climate change to biotechnology and invasive species. Ris' UCS successes include enacting legislation that resulted in the introduction of hybrid cars; improving safety standards for nuclear facilities around the nation; enacting tax incentives for renewable energy which have allowed alternate technologies to gain solid footing; and mobilizing the scientific community to demonstrate consensus on the need for action on climate change. After leaving UCS, Ris became a senior fellow at the World Economic Forum in Geneva, Switzerland where he was a key figure in debates on such issues as global warming. He returned to the States in 2005 to take the helm of the New England Aquarium in Boston, Mass., as president and CEO. It is to ESF's George Curry that Ris attributes his ability to break complex issues into smaller components and arrive at a solution. "Professor Curry was a very instrumental figure in my life. He taught me that no problem was too big to solve, and he gave me the skills - and the confidence - to do it." "In those early days of the graduate program in the School of Landscape Architecture, there was a great sense of idealism - a lot of it inspired by our principal mentor, Professor Curry. He helped us understand where the profession of landscape architecture fit into the larger scheme of things - especially how the natural world and human society intersect - and how we could make the world a better place." Verostek to present on Fletcher Steele Famed landscape architect designed over 700 gardens in U.S.
Scott KasprowiczBroke circumnavigation record - One stock helicopter, two guys, 15 countries, 24 time zones, 23,000 miles, in less than two weeks. James "Jake" McKennaOwner of Parsons-McKenna Construction Co.
Bruce BrownellOwner of Adirondack Alternate Energy (AAE) in Northville, N.Y.